Hallmark Communities’ Hayden Ranch Lot 1. Run don’t walk; you won’t want to miss out on this Builder’s Sizzling Summer Special. 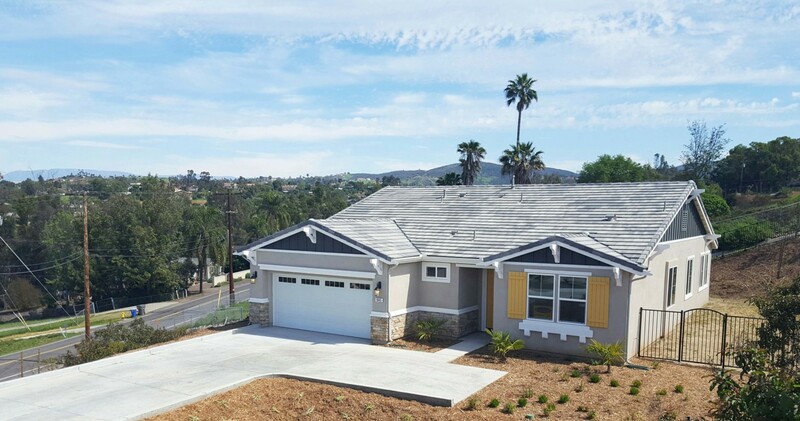 Open House featuring a brand new home in the much sought after Hayden Ranch Community in Vista Saturday and Sunday from 11:00 AM to 3:00 PM at 1845 Hayden Ranch Road, Vista. It’s a “one of a kind homesite” with the picturesque hillside location offering sweeping panoramic views and, at almost a full acre, it also offers rare privacy from your nearest neighbors, yet with only nine homes in the entire community on a private cul-de-sac street, you will enjoy the family-friendly feeling that only a small village-like community can offer. No Mello-Roos fees, low HOA dues and priced at just $629,900 along with a July Builder special of $10,000*, makes this home an incredible value and your perfect choice!! You’ll fall in love with this single level, ranch- style home featuring 2015 sq. ft. of living space, 4 bedrooms and 3 baths with an open floor plan/great room concept that is perfect for family and entertaining. You will also be amazed at the abundant designer selected amenities and upgraded flooring throughout that is both beautiful and durable and the versatile custom two tone interior wall paint will allow you many creative accessory and accent color choices. Clad with rich custom colored hand-rubbed cabinetry with self-closing drawers and doors, convenient counter seating, elegant granite countertops, sleek stainless steel professional appliances and a generous walk-in pantry, the kitchen inspires sumptuous masterpieces that are a joy to create for your friends and family. Wake up every morning to amazing views from the master retreat that boasts a wonderful, spa inspired bath and spacious walk-in closet. Additionally, there are three guest bedrooms, a generous laundry room complete with a soaking sink and overhead storage cabinets, and an attached 2 car garage fully finished with wall texture and paint. The Low Voltage structured wiring system and an active security system will keep your home in tune with today’s technologies and the tankless water heater and efficient, refreshing Central Air Conditioning and Heating system with set-back thermostat combine to attribute to a highly energy efficient home. Be sure to join us at the Open House on Saturday and Sunday located at 1845 Hayden Ranch Road from 11:00 AM to 3:00 PM. *Contact Sandy for further details at 760-532-6242.